Serverless computing allows you to build and run applications and services without having to manage servers. AWS Service Catalog allows you to create and manage catalogs of services that are approved for use on AWS. Combining Serverless and Service Catalog together is a great way to safely allow developers to create products and services in the cloud. In this post, I demonstrate how to combine the controls of Service Catalog with AWS Lambda and Amazon API Gateway and allow your developers to build a Serverless application without full AWS access. For this example, I have written a Lambda function that returns sample JSON and uploaded it to Amazon S3. 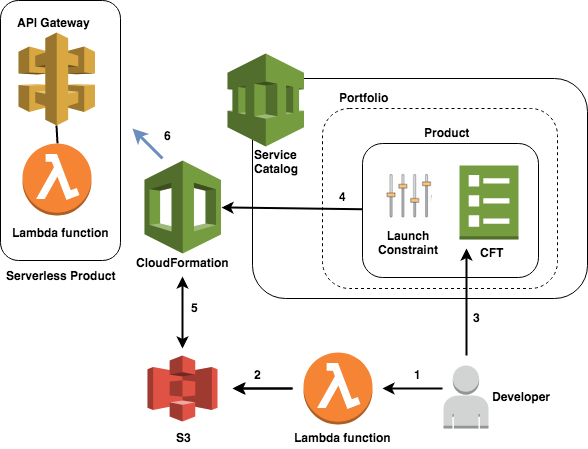 I then created a product in Service Catalog that leverages an AWS CloudFormation template to deploy a Serverless product calling the Lambda function and API Gateway. There are a few basic actions to take before allowing developers to build their Serverless application. The following steps require administrator access to AWS resources via the AWS Management Console. Choose the AWS Region in which to host this Serverless application. Create an S3 bucket to host your Lambda code package. Compress/ZIP this file with the name serverlessapp.zip you may have to rename the zip after compressing it, but ensure the file that gets uncompressed has the serverlessapp.py name. Create an AWS service role for Lambda so that your application can inherit and execute against AWS resources. Service Catalog acts as the landing zone for your developers to access building and launching Serverless applications. They only have access to build and launch things from Service Catalog itself. Products created in Service Catalog are all based on CloudFormation templates. Log out of the Management Console as your admin user and log back in as the developer user you created in the previous step. Create a Service Catalog portfolio for the developer or developers who should have access to build Serverless applications. Add the developer user that you created to the portfolio. Description: Who owns this Serverless Application? Enter email here. Description: The serverless url you can test in a browser. Description: The name of the lambda function. Description: The name of associated API Gateway. Description: The S3 bucket your serverless app resides. Description: The serverless app zip file name. Go into your portfolio and choose Upload new product. For Select template, choose Upload a template file. Applying a Service Catalog launch constraint is the way to control developer access to Lambda functions, API Gateway API actions, and other resources for Serverless applications through a IAM role and not through individual user management console access. In your Service Catalog portfolio, expand Constraints. With CloudFormation templates and Service Catalog, you can build a Lambda template that allows you to launch and configure the specific resources that your Serverless application needs. The output of the CloudFormation template provides you with the API Gateway entry point to your Lambda application. In the Service Catalog console, choose Product List. 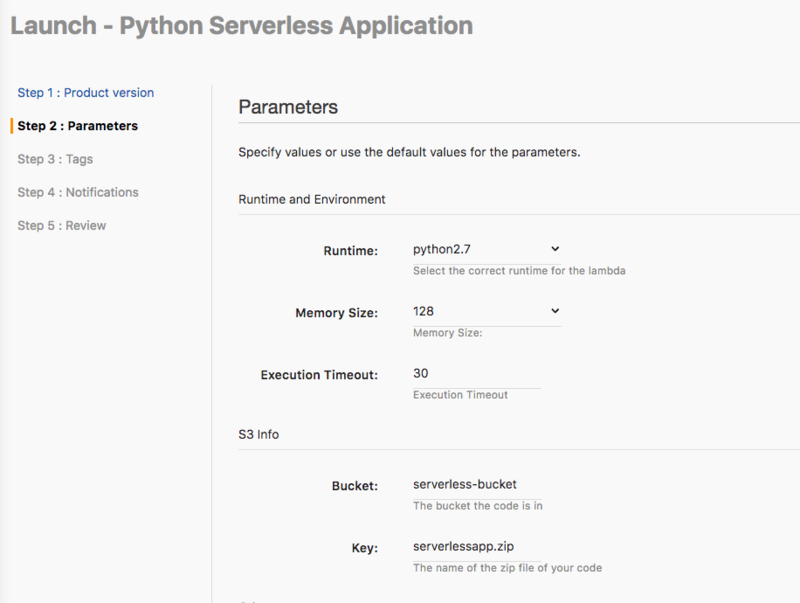 Choose the Python Serverless Application option and choose Launch product. Leave the rest of the fields as their default values, and choose Launch. In this post, I’ve demonstrated how to use Service Catalog and allow your developers to create Serverless applications safely without giving them access to the AWS Management Console. Service Catalog can also allow you to give limited granular access for deploying S3, Amazon EC2, and other AWS services in the same manner, making it a powerful control mechanism. 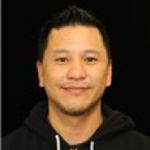 Phil Chen has been designing and deploying AWS architectures for over 10 years and loves helping customers do the same.